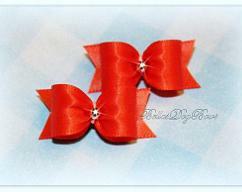 5/8 SET - Orange Satin Bows with Matching Flags / Silver Bead Centered - 2pcs. 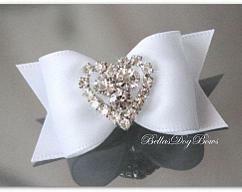 7/8-L Red & White "Puppy Love" Heart Print Bow with Glitter Heart Dog Bone Embellishment. How much fun is this little bow! ... This is a must have for the summertime fun at picnics, barbecues and all outdoor activites. Bow is crafted with a lovely rosy pink and yellow gingham ribbon and has matching rose color flags and also lined in a satin rose ribbon. 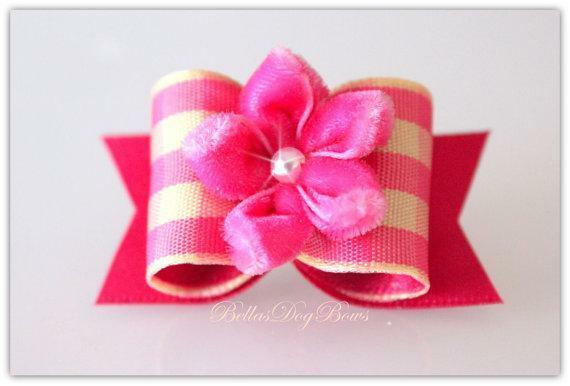 A sweet plush pink petal flower with a white pearl finishes off this bow beautifully. ** Measures approx. 1" x 1-7/8" from flag to flag. ** Embellishments have been hand sewn-on to ensure your pet's safety. ** Each bow has two strong orthodontic bands hand sewn-on to attach to top-knot. ** Packaged in a crush proof box and promptly delivered. ******* FREE STORAGE BOX (pictured above) for your Bows on all order $30 or more! ****** You must request this box at time of placing your order and offer is only available while supplies last.